Moore is famous for his delicate low tones and the tissue-like garments in which his figures are draped. Despite suffering from a painful illness, he was determined to paint up until his death and produced some of his finest works in later life. About the artist: Albert Joseph Moore (1841 – 1893) was an English painter, known for his depictions of the female form set against classical and luxurious backdrops. 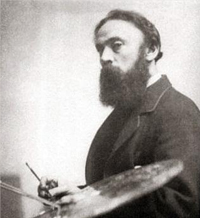 Moore’s early works show the influence of Ruskin. In 1861, his style began to develop when he made a new venture with two sacred subjects, The Mother of Sisera looked out of a Window (now on display in the Tullie House Museum and Art Gallery, Carlisle) and Elijah running to Jezreel before Ahab's Chariot. He found his admirers among the few true connoisseurs of art rather than the general public. His pictures were frequently sold before completion, but it was not till late in his life that he obtained direct patronage. Moore is famous for his delicate low tones and the tissue-like garments in which his figures are draped. Though suffering from a painful terminal illness, Moore worked up to his death. His last picture, The Loves of the Seasons and the Winds, is considered one of his finest and important works. His paintings are now on display throughout the UK, most famously The Open Book in the Victoria and Albert Museum in London.